CBD’s meteoric rise in popularity has hemp growers finding all kinds of market opportunities that don’t exist for THC products, including yoga studios, pet boutiques, gyms and coffee shops – all foreign territory for marijuana-derived products. One Kentucky hemp producer even has CBD products being sold in tractor supply stores; a North Carolina CBD company has a line of lotions on sale in ethnic beauty supply stores. Even so, the sector lacks significant penetration into most mainstream retail establishments. Hemp Industry Daily’s analysts aggregated major retail sectors in the U.S. and compared those against how common hemp-derived CBD products fare in such outlets. 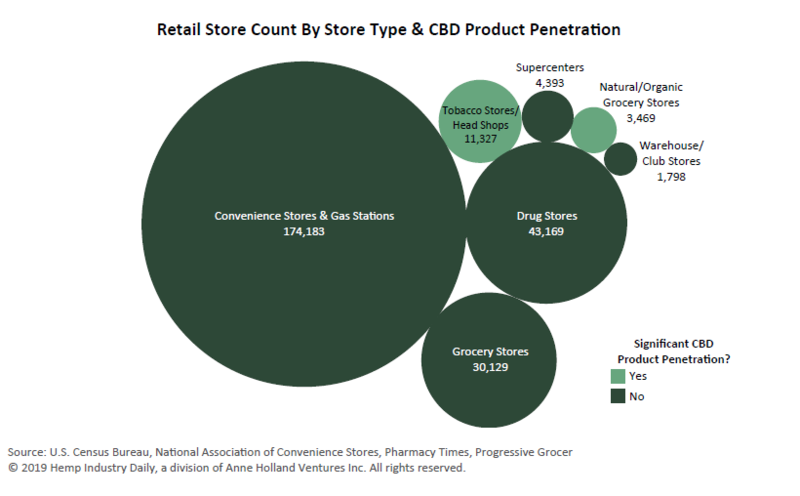 As of 2018, our research shows that CBD products have significant presence in two kinds of retailers – tobacco stores/head shops and natural/organic grocery stores – in other words, specialty retailers that aren’t exactly on every corner. When compared to goods sold in conventional drug and grocery stores and convenience stores, it’s clear that CBD has a long way to go to get in front of mainstream shoppers who aren’t making special trips to buy CBD products. The big question for the hemp and CBD industry is: How long will it take to see those kinds of Main Street retailers pick up CBD? That question can’t be answered until the U.S. Food and Drug Administration gives mass-market retailers additional assurances that CBD foods, drugs and cosmetics are approved. “What the FDA says, goes,” said Whitt Steineker, an Alabama attorney who advises clients selling foods and beverages. “Unfortunately, we’re kind of in a wait-and-see” posture on CBD, Steineker said. That said, some mainstream retailers aren’t waiting for explicit federal permission. Nieman Marcus, a high-end department store headquartered in Dallas, recently announced it will stock CBD beauty creams in stores in California, Colorado and Massachusetts – all states where recreational marijuana is also legal. And the Bartell chain of drug stores in the northwestern U.S. said it stocks five brands of CBD products, including supplements, tinctures and creams, in at least 40 locations. CBD manufacturers are hopeful that early retail adopters will inspire others to follow suit. Test, test, test. Your products must be provably shelf-stable, with labels that accurately reflect the CBD amounts inside. Get product-liability insurance. Mainstream retailers won’t carry products without it. Develop a recall plan. Mainstream retailers will need you to have procedures worked out for the possibility that regulators issue a recall of your products. Have consistent supply. Products that are only seasonally available or available only in certain regions won’t have the broadest appeal. Be realistic about how many stores you can supply year-round. Be prepared to wait. The larger your retail footprint, the longer it may take to get paid. Manufacturers routinely wait 90-120 days to see money from products sold by retailers. To see more data and analysis about the hemp industry in the wake of the 2018 Farm Bill, download our free report. Hemp-confidential.com is a multi-platform publisher of news and information. Hemp-confidential.com has earned a reputation as the leading provider of Hemp News and information that improves the quality of life of its readers by focusing on Hemp issues. @2018 - Hemp-confidential.com. All Right Reserved.